Robotic hazardous materials response operated remotely by trained specialists. Community paramedicine proactively provided by a nurse practitioner and paramedic in the field. Recruiting members not only to be firefighters but community service providers. All three are real world examples of how fire departments across the country are adapting to address current issues and future trends. Their goal in adapting? To remain relevant and sustain their operations in the future. Earlier this year, CPSE became an ICMA Presidential Level Strategic Partner, building on the historic connection between CPSE and ICMA. A current priority of ICMA is Research and Thought Leadership. 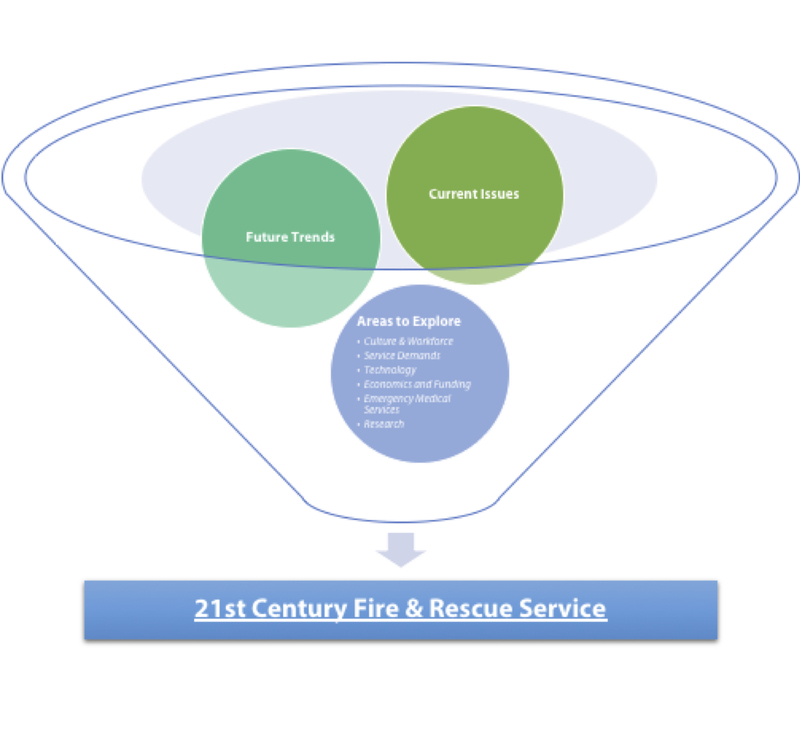 This, coupled with CPSE’s mission of leading the fire and emergency service to excellence, found our organizations well-suited to partner on developing a white paper exploring the 21st Century Fire and Rescue Services. Borrowing from a similarly-titled paper on policing (the Final Report of the President’s Task Force on 21st Century Policing) developed by the Obama administration, this paper will analyze the societal, technological, economic, and political factors facing the fire service today and in the future. The goal of the white paper is to have active city/county management and fire department experts come together to chart the course for the modern fire service. This unique collaboration by these two groups will result in a fire service that is better prepared to meet the increasing expectations of the public while providing transparency in their actions, making decisions based on hard data, and promoting a culture that can adapt quickly and innovate with creativity. The small technical working group (TWG) formed to develop this paper will not be acting in a vacuum. During the first in-person meeting held earlier this week, the importance of engaging numerous and diverse voices was repeatedly expressed. Building on CPSE’s position as a big-tent public safety organization, over the next six months, through a series of in-person information gathering sessions and many online surveys, the TWG hopes to hear (and learn) from elected officials, the public, labor, fire department management, city/county management, and other stakeholders involved in the delivery of public safety services (such as medical directors, police chiefs, and dispatch center management). As with any research/exploration effort, things may be left on the table. By including Research as a key topic of exploration in the paper, the TWG will be able to identify areas that should continue to analyzed and further explored. The environment within which fire departments operate is changing at an increasingly fast (and sometimes contradictory) pace. Urban revitalization in one community may be offset by urban decay in another. Smart city initiatives in one municipality may be met by a renewed focus on walking trails and bike paths. Given its integral role in the community, any change affecting the community in turn affects how the fire department must operate. For example, while denser living requires alternate fire code application, smaller streets call, in turn, for smaller or more maneuverable apparatus. The kick-off meeting, held at the ICMA Conference in Baltimore on September 23, saw the project scoping phase draw to a close. Rather than rushing to develop the white paper, the TWG believes in the philosophy of slow and steady wins the race. Through May 2019, the TWG will collect input through surveys (delivered both in person and online) and through facilitated feedback sessions. 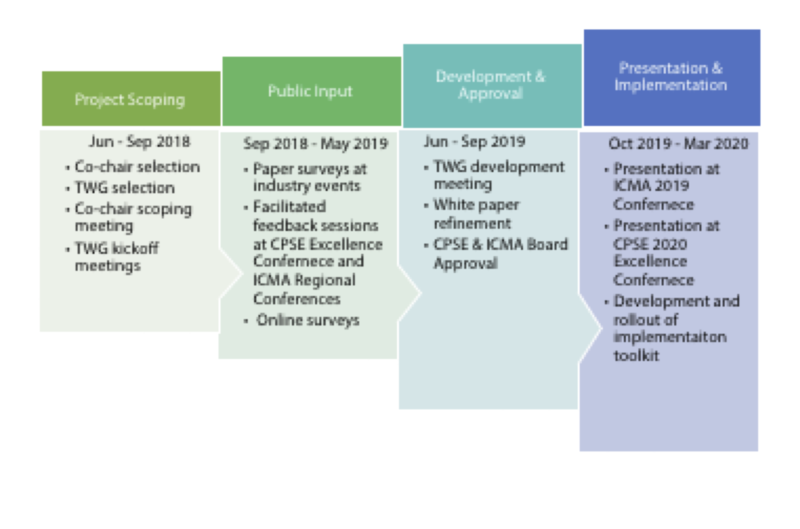 Following the public input phase, the TWG will spend the summer developing the paper and sharing it with both CPSE’s and ICMA’s boards for approval. Both the questions being posed and the content of the paper are intended to be proactive. The TWG is committed to having courageous conversations with others (and among themselves) about how to continue to protect lives and property and safeguard fire and rescue personnel while also rethinking our models and practices. Once developed, the goal is to share their findings not only through a written document but also through presentations and an implementation toolkit. Former General Electric CEO Jack Welch once proclaimed, “Control your destiny or someone else will.” CPSE invites those in our community to control your destiny by providing public input. Be on the lookout for emails from CPSE and/or ICMA requesting your feedback and we hope you’ll join us at one of the in-person feedback sessions to be held in the early part of 2019. For further information about the CPSE and ICMA partnership and the development of the 21st Century Fire and Rescue Services white paper, please contact CPSE’s Chief Executive Officer Preet Bassi, CAE, at pbassi@cpse.org. NextStrategic Planning – That is for Business, Right?